For the first time, a team of chemists and engineers at Penn State University have placed tiny synthetic motors inside live human cells, propelled them with ultrasonic waves and steered them magnetically. It's not exactly "Fantastic Voyage," but it's close. The nanomotors, which are rocket-shaped metal particles, move around inside the cells, spinning and battering against the cell membrane. "As these nanomotors move around and bump into structures inside the cells, the live cells show internal mechanical responses that no one has seen before," said Tom Mallouk, Evan Pugh Professor of Materials Chemistry and Physics at Penn State. "This research is a vivid demonstration that it may be possible to use synthetic nanomotors to study cell biology in new ways. We might be able to use nanomotors to treat cancer and other diseases by mechanically manipulating cells from the inside. 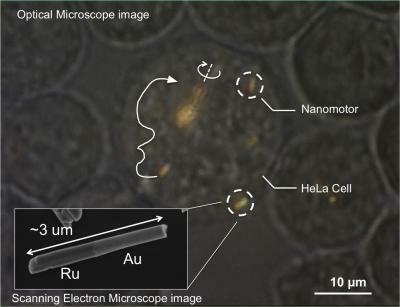 Nanomotors could perform intracellular surgery and deliver drugs noninvasively to living tissues."